Fauquier Community Band supports our community by providing free concerts that are enjoyed by audiences of all ages and interests. The band also provides music for a variety of community events such as the Warrenton Town Limits Celebration, the 4th of July Children and Pets parade, Earth Day at Crockett Park, and more. And Fauquier Community Band relies on the community to support our mission. Because all of our members are volunteers, our expenses are very low. But we do need financial support for expenses such as purchasing music, paying for rehearsal space, and printing programs. 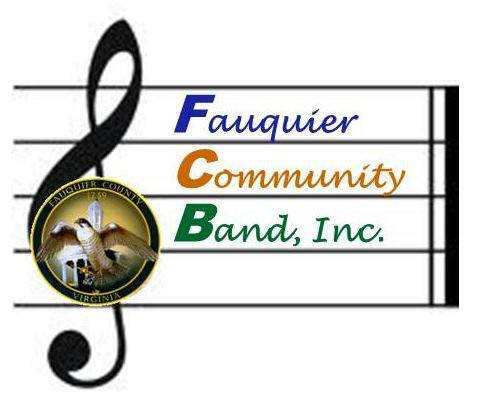 Fauquier Community Band, Inc. is a 501(c)3 nonprofit organization. Contributions to the Fauquier Community Band are tax-deductible to the extent allowed under applicable law. Donations to the band are much appreciated! You can donate in person at any of our performances. You can also donate with a credit or debit card. Just click the button to get started. Donations are processed by PayPal, but you don't have to have a PayPal account. The band raises funds by conducting a raffle at each of our concerts. If you are interested in donating a prize for the raffle, please contact us! announced during the prize drawings. Raffle prizes generally have had values of $10-$70. If you use the link below (or on our home page) when you shop at Amazon, the band will receive a commission. It doesn't cost you any extra. So every time you're going to Amazon, come to FCB first! You can also support the band by helping us promote our concerts! Put our concerts on your calendar and tell your friends about them! _Visit our Facebook page! Like us, and you'll get band updates in your news feed. Share the FCB page on your timeline so your friends will also know about the band.